Nigerian Men In Tears After Scam Syndicate Is Busted! Nigerians and a Filipino accomplice allegedly behind an "online scam syndicate" that victimized Filipino overseas workers (OFW) and other nationalities, during overnight raids in the city of Imus in the province of Cavite on Sunday. Chief of Police of Imus City Supl. Audi Madrideo said that Nigerians, mostly between 20 and 30 years old, entered the country using student visas. He said the suspects, on Facebook, posed as members of the US Army. UU When using stolen images and profiles. "They would court their victims through chat, and once they got hooked, they promised to send them gifts or money, some as much as $ 2.5 million," said Madrideo. The trap, however, was that in order for them to send the package, the victims had to send the money first to pay for the shipment or the customs duties. "According to a witness, they have been in my area for eight months (Imus), but we found out that they also faced similar complaints in Las Piñas and Pasay City (in the metropolitan area of ​​Manila) before moving to Cavite," said Madrideo. Emmanuel Nnandi, one of the group's alleged leaders, was arrested in a capture operation around 7:30 p.m. On Sunday, at a money transfer store in Barangay (village) Tanzang Luma 2. Nnandi took the authorities to other members of the group who were subsequently arrested in three apartments. Police discovered that Nigerians had entered the country using student visas. 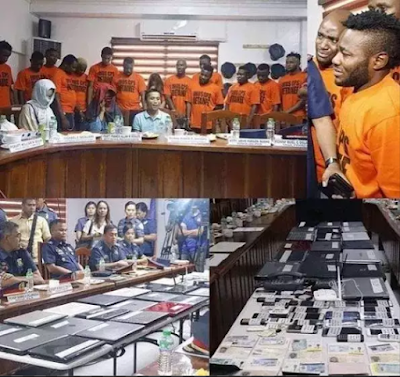 Madrideo said the Nigerians and the Filipino suspect had been subjected to an investigation process on Tuesday for syndicated fraud. "We have coordinated with Interpol because the victims were not only Filipinos but also people of different nationalities, who (the suspects) can face possible deportation, depending on what we are about to discover," he said.